Presidential historians will note this was the week the words “Trump,” “prostitutes,” and “urination” somehow found themselves used publicly in the same sentence. While the implied acts in the sentence aren’t verifiable, the words are, and they appear in the dossier U.S. intelligence chiefs presented and discussed with Trump last week. That made the subject fair game to be reported broadly in the public interest. The less tasteful can get their salacious details elsewhere. But the basic reports aren’t fake news, as it’s important to the nation whether Russia had compromised the soon-to-be-leader of the free world. It all troubles Rep. John Lewis of Georgia. “I don’t see Trump as a legitimate president,” Lewis told NBC News. The Russians may or may not have had something on Trump, But Lewis thinks Trump was Russia’s preferred candidate. As we enter into this Martin Luther King Jr. holiday weekend, Lewis is a man whose words resonate. 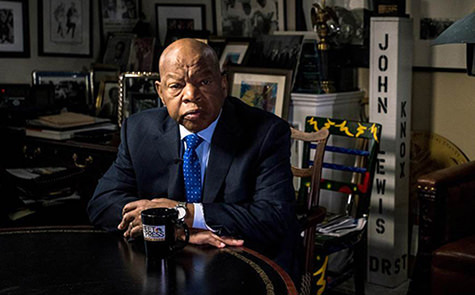 Lewis was beaten up by state troopers when he marched from Selma to Montgomery–the nonviolent protest that led to passage of the Voting Rights Act in 1965–and later went on to serve in Congress for 30 years. In 2013, Lewis received AALDEF’s Justice in Action Award. The man’s moral compass was shaped fighting for civil rights alongside Dr. King. You can trust his instincts. 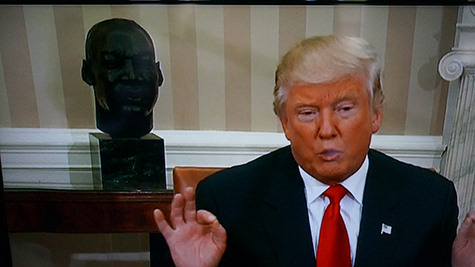 This, incidentally, will be our last MLK weekend with the glorious bust of America’s civil rights hero in the White House. During his tenure, President Obama had the MLK bust replace that of Winston Churchill, which was moved to the private residence. Reportedly, the incoming president has told the British that Churchill shall make like MacArthur and return to the Oval Office. Even before Churchill arrives, you’ll feel the difference by next weekend, when our march will seem like it’s heading backwards. For Asian Americans, I always wonder where we are in terms of racial progress. Every time I sense movement, there are always reminders, big and small, of what we’re fighting against. This week, a shout out goes to those hip hop arbiters of American culture, Desus and Mero, aka the Bodega Boys, who on their Viceland channel show pricked the daytime TV host Steve Harvey and his recent slam on Asian American men. On his own program, Harvey showed the cover of a book, How to Date a White Woman: A Practical Guide for Asian Men. You mean in the age-old universal denigration of the Asian male, society hasn’t fully digested the Chow Yun Fat/Jet Li memo yet? Desus and Mero then skewered the talk show host’s publicity shot, with Harvey in a bare-chested Putin pose sans horse. “Looks like a glazed ham,” said Mero. It’s not exactly justice, but it was brothers taking down a brother. My two words for Steve Harvey: Miss Colombia. And don’t think Asian American women these days are doing much better. Consider Doris Truong, a past president of the Asian American Journalists Association and a home page editor for the Washington Post. And there was Miss Anonymous! An Asian face! It was not, however, as many conservatives tweeted, my friend Doris. Since no one remembers The Andy Griffith Show, conservatives did the next best thing: They tweeted out this injustice! And it made sense: Truong, a member of that liberal news cabal, the Washington Post, was somehow caught red-handed, as if some Chinese spy. But it wasn’t Truong. Just wrong. Truong called them out as fake news. Unfortunately, that’s the kind of thing Asian Americans are too often subject to. Man or woman. We’re foreigners. We’re spies. We’re people’s worst stereotype. We’re what’s wrong with the picture. More galling is how even when we’re legitimately part of the news, we’re left out of the coverage. I watched the Tillerson hearings all day Wednesday but saw no coverage of Elaine Chao’s three-hour confirmation hearing for Secretary of Transportation in the electronic media until I saw a bit in the New York Times the next day. 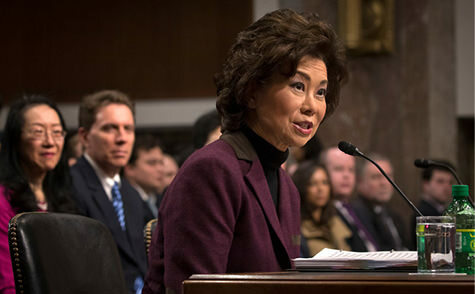 Chao’s the successful Asian American female stereotype, a former Bush cabinet member, who’s also married to Senator Mitch McConnell. So no controversy, no news? Rubber stamp the model minority! Is that really better for a woman who will be in charge of Trump’s potential infrastructure overhaul that could cost $1 trillion? On the channel I watched, that anonymous Asian woman sitting behind Tillerson had more face time than Chao. The little slights we may have to deal with on our own. But who will be there to help us when discrimination rears its head in issues like voter suppression? A decent attorney general would. But Sen. Jeff Sessions isn’t it. When the Voting Rights Act was gutted by the Supreme Court in 2013, Sessions cheered. He’s one of the major perpetrators of the myth of voter fraud. Does it happen? Does four cases of voter fraud out of 135 million votes in 2016 sound like it? Judging by what he’s done in his home state of Alabama, he’d only make it harder to vote, requiring obstacles to the ballot like cumbersome and unnecessary voter ID laws. Would he help Asian Americans? Forget his parading around an Asian American granddaughter. The answer, based on his record, is no. 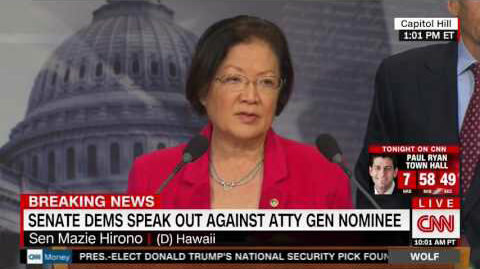 Already, Judiciary Committee member Sen. Mazie Hirono has said she won’t vote for him. Sessions may yet make it out to a full Senate vote, but it won’t be until after Jan. 20. But it was once again Rep. John Lewis whose voice seemed to carry the moral weight against Sessions. Dr. Martin Luther King, Jr. couldn’t have said it better.